1345 CE is a year that some people prefer to forget. But tucked away in a file and forget folder is the Conjunction of 1345. A Conjunction, and an Eclipse, happening in 1345, judicial Astrologers pretended to foretel some mighty and fatal Events to follow. The Conjunction of 1345 may be of interest to several catastrophist communities because it’s a “triple conjunction” involving Saturn, Jupiter and Mars. Giovanni Viliam devoted a chapter of his history of Florence to the triple conjunction of 1345 of Saturn, Jupiter and Mars in the sign Aquarius in the belief that such conjunctions were of great significance to the age. 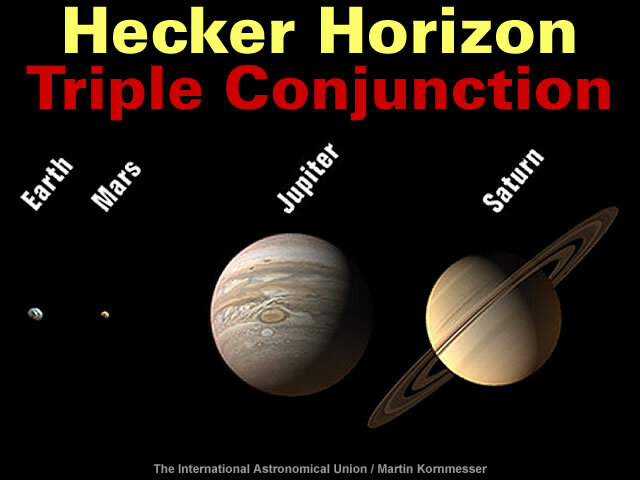 The Triple Conjunction of 1345 was predicted to occur in the second-half of March. Master Pagolo di ser Piero placed it on March 28, a little after the ninth hour, in the twentieth degree of Aquarius; but according to the Almanack of Profatius Judaeus and the Tables of Toledo it ought to occur on the twentieth of March, with Mars in the 27th degree of Aquarius, and with a lunar eclipse on the eighteenth in the seventh degree of Libra. It’s claimed the Triple Conjunction of 1345 occurred on 28th March. But according to the aforesaid Paul, one of the modern masters, he observed the conjunction with his instruments on March 28th, with the sun in the 16th degree of Aries and in its exaltation, and its house, Leo, in the ascendent at thirteen degrees, while Mars was already in the sixth degree of Pisces, Venus in its own house in the 14th degree of Taurus in midsky, Mercury in the first degree of Taurus, and the moon in the fourth degree of Aquarius. It’s not clear how precisely aligned the planets had to be to qualify for a “conjunction” in 1345. However, modern retro-calculations indicate a precise Mars-Jupiter alignment occurred on the 2nd March 1345 and that [both] Saturn and the Moon were in close proximity. The retro-calculation is for 00:45:00 on the 2nd March 1345 according to the Gregorian calendar. Coordinated Universal Time (abbreviated to UTC) is the primary time standard by which the world regulates clocks and time. UTC divides time into days, hours, minutes and seconds. Days are conventionally identified using the Gregorian calendar, but Julian day numbers can also be used. The difference between the observed date of the Triple Conjunction of 1345 and the retro-calculation is 26 days. The difference increases to 36 days when the retro-calculation is converted to the Julian calendar that is said to have been operational in 1345. The Gregorian calendar is the most widely used civil calendar in the world. The calendar was developed as a correction to the Julian calendar, shortening the average year by 0.0075 days to stop the drift of the calendar with respect to the equinoxes. To deal with the 10 days’ difference (between calendar and reality) that this drift had already reached, the date was advanced so that 4 October 1582 was followed by 15 October 1582. Explaining away these 36 days is an interesting challenge. If you believe the retro-calculation then the antique predictions and observation are wrong. If you believe the observational data then there are problems with the gradualist calendar narrative. The Earth experiencing an orbital excursion between 914 and 1409 CE. Another peculiarity of the Comet Halley chronology is that it suggests the Earth experienced an orbital excursion between 914 and 1409 CE. No doubt there are other ingenious ways to explain away the 36 day discrepancy. Gallery | This entry was posted in Astrophysics, Books, Catastrophism, Comets, Hecker Horizon, History, Moon, Old Japanese Cedar Tree, Solar System. Bookmark the permalink. Tim, this man and others he refers to, shows that there are hotspots for electrical magnetic activity. There appears to be a 40 year cycle? Grist to your mill, maybe? 9 Aires would be 28th March give or take a day or so and adjusting for location. 7 days missing? Also http://www.ievpc.org is an affiliated site for more specific research. The systems, galaxies, star systems, “atoms” are all a result of charge. Electromagnetic force, EMF, drives the spiralling orbits and toroids. Without aether vibration, there is no charge. Charge dispersal creates EMF. Discharges from the massive charge carriers that we call filaments do not seem to occur. The stars that pinches of the filaments have created, do discharge. The systems are not perfectly stable, they cannot be, as they grow in spurts. Planets are destined to become stars. Sol was once red, then orange and now yellow. It will become blue. Like its parent body, Sirius Alpha. It will take 8 years before we know if Sirius spawns another sun. That will appear as a red/brown dwarf. It will be an indication of filamentary boost to the pinches controlled by it. Solar discharges may ramp up, prior to a similar pinch increase, diminishing the radius of the star and expelling material. Sorry, got distracted by ideas. I meant to say as charge increases, the “orbits”, (not orb like at all, we need a new term!) will speed up or slow, as I think you say! “Explaining away these 36 days is an interesting challenge.” An interesting challenge and thank you for the clues it/you provide.. I first suggest you download ‘Solar Simulator 2’ ; seems accurate enough. Then key in all planets and look up the date – March 3rd 1345 – and look what it shows. First note the sun is furthest from system barycentre. Near barycentre are Saturn Jupiter Neptune Mercury and Mars. 90deg off are Venus Pluto and Uranius. Directly opposite all is the Earth-Moon duo. Earth and its moon are one planetary mass in this situation, but over 24 hours the moon can be in a position to add its own push to change things. The date is March, nearing the equinox, therefore the tilt of the earth is perpendicular to all. It could be that the pull of the rest of the system + moon will turn the oblate Earth towards the system CG; a seasonal jump of possibly about two months ( and a gyro effect on tilt). But I tend to think it would be more cataclysmic than history indicates. The astronomical experts; the climate-change gang; and most of us lesser mortals believe that obliquity follows the polynomial curve dictated by Newcomb et al . Yet others have shown that the RWP, MWP, MGW LIA follow the peaks and roots of the Eddy cycle. I found the events in the Holocene max, including the Dodwell date -2345bce- do so too. Also Dodwell indicated the during the last two millennia obliquity oscillated – not followed a smooth curve- , which oscillations do seem to match the Eddy cycle (but it is still speculative). It is still early work and somewhat speculative but a planetary forcing agent looks like a promising culprit to the multitude anomalies of ‘settled science’. Explaining how they work is another thing altogether. The “galactic tide” appears to “push” and “pull”. The Apex of the Sun’s Way, or the solar apex, is the direction that the Sun travels relative to other nearby stars. This motion is towards a point in the constellation Hercules, near the star Vega. The example given above re ‘galactic tides’ I still have to understand properly, but I sense it is extremely long period event. Even precession at ~ 25k years is long compared to a stretch in the Holocene. The sun and planets of the solar system have far greater influence gravitationally between themselves and so on Earth’s behaviour, and appear to be on right time-frames that seem to match perceived events on Earth. (I say this with hind-sight since I have proof of tilt change and dated to some reliability). That story is in favour of a body, Mars or Venus, reacquiring a coma, hair, and destroying the pillars of Hercules, flooding the land of the Philistines and probably, the Mediterranean? Seems very abstract as a connection? The amount of salt in the Dead Sea strongly suggests inundation at some time. Do you agree? What “myth” would retell such a fascinating event? The Samson story retains the myth structure throughout.